Your order will ship MONDAY if placed in the next 2 hours 55 minutes . Enter your shipping address zip code to receive an instant delivery date estimate from UPS. Federal Law Enforcement Tactical Bonded 9mm Luger Ammo 135 Grain +P Hollow Point ammo for sale online at cheap discount prices with free shipping available on bulk 9mm Luger ammunition only at our online store TargetSportsUSA.com. Target Sports USA carries the entire line of Federal Law Enforcement ammunition for sale online with free shipping on bulk ammo including this Federal Law Enforcement Tactical Bonded 9mm Luger 135 Grain +P Hollow Point. Federal Law Enforcement Tactical Bonded 9mm Luger 135 Grain +P Hollow Point ammo review offers the following information; For nearly a century Federal Ammunition has put its focus on manufacturing quality products with cutting edge technology. This dedication to excellence has given Federal a competitive edge as an ammunition technology giant. Today the company is well known for producing high grade centerfire, rimfire, and shotshell ammunition that shooters everywhere know and trust. Law Enforcement Tactical 9mm Luger by Federal is 135 grain +P ammo with a 135 grain jacketed hollow point bullet. 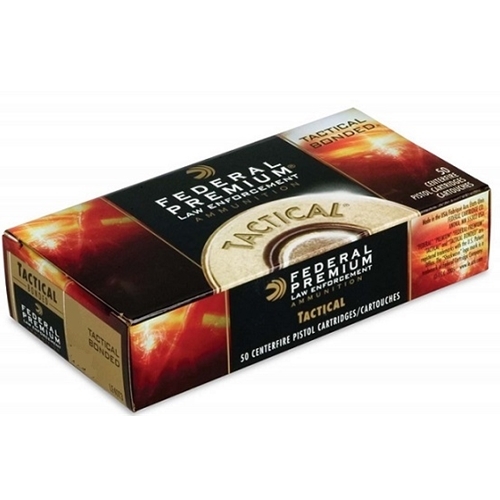 This ammo features nickel plated brass casing and boxer primer. 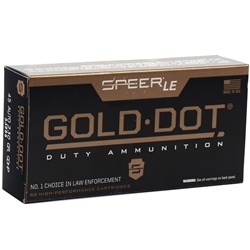 This Law Enforcement ammo is designed for optimized performance and dependable accuracy and barrier penetration. The jacketed hollow point allows for unmatched weight retention and expansion that get the job done when it matters most. The premium components of this 9mm Luger ammo make for a self defense round you can rely on to defend yourself and your home should you need it. Federal LE Tactical offers a muzzle velocity of 1060 feet per second and a muzzle energy of 335 ft lbs. This 9mm Luger ammo is packaged in boxes of 50 rounds and cases of 1000 rounds. Free shipping is available on bulk case orders of this Federal Tactical 9mm Luger ammunition. Law Enforcement Tactical 9mm Luger by Federal is 135 grain +P ammo with a 135 grain jacketed hollow point bullet. The jacketed hollow point allows for unmatched weight retention and expansion that get the job done when it matters most. The premium components of this 9mm Luger ammo make for a self defense round you can rely on to defend yourself and your home should you need it. No issues whatsoever with Federal Law Enforcement Tactical Bonded 9mm Luger Ammo. Pricey. Superb 9mm JHP ammo. A nice accommodation between the speed of 124+P and the weight of 147+P. My go-to ammo for EDC/self-defense. And Target Sports USA's service is excellent. You will know what I know the first time you use this ammo. As tony the tiger would say Gerrrrate!